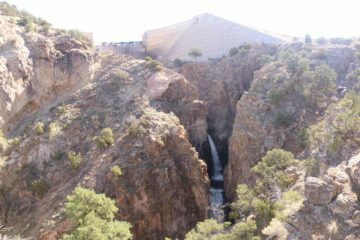 New Mexico Waterfalls seemed like an oxymoron to us as we thought this state was nothing but desert, aliens (think Roswell), and nuclear research projects (think Manhattan Project) as well as military bases. But that notion just illustrated how little we knew about the state. After all, the Rocky Mountains extended further south from Colorado into the northern and western regions of the state. 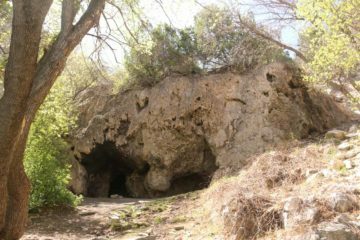 Indeed, our preconceptions were shattered upon making a brief visit to the state, where we happened to see three waterfalls while experiencing the state’s charming capital of Santa Fe. We also felt the strong Native American presence as much of the state consisted of reservation lands, but we certainly could see and feel the influence through the people we’ve encountered, the art and architecture, and the things that we saw during our hikes and explorations here. While we’re due for another visit to the state to do this place more justice than before, this page does display our humble sampling of what we were able to share with you when it came to waterfalls. 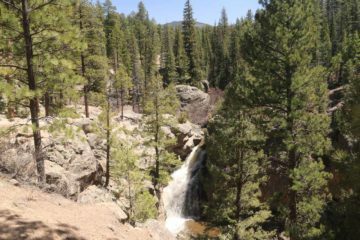 Speaking of which, of our humble sampling of falls, perhaps the most impressive and natural to us was the Jemez Falls which was pretty much left intact in high altitude forested settings. 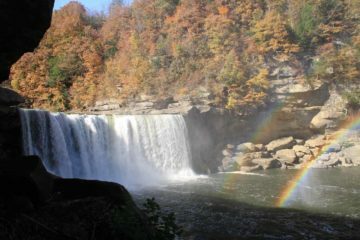 In addition to an overlook, it also featured an upper falls with a swimming hole to beat the heat. Then, there was Nambe Falls which was the tallest one we saw in the state though it was in the presence of an imposing dam. We’re keen to make a return trip to augment and complete our list of falls here though given the harsh desert climate and the distances involved, we’ve definitely got our work cut out for us if we’re to pursue such goals.